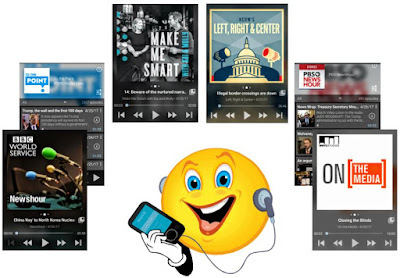 Here’s my top ten list of podcasts that help me understand the truths about important issues. 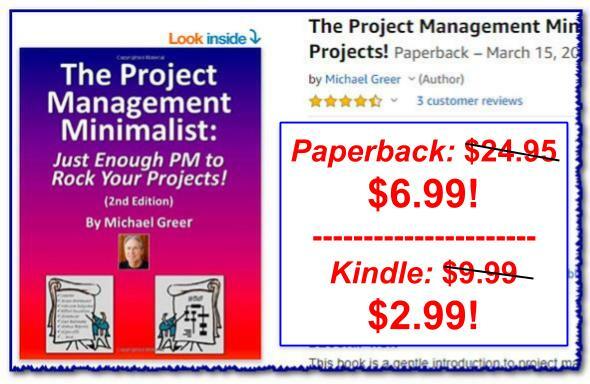 These typically present clear, in-depth overviews of the issue, nuanced arguments, defensible (and often conflicting!) conclusions and challenging, deep-mined bits of evidence. And they go to great lengths to make sure both (and frequently, all) sides of an issue are explored in depth. Commentators and contributors to the podcast are authoritative. They have a solid track record not as political or partisan hacks, but as critical-thinking people who have deep experience engaging the topics as truth seekers. The ideas presented in the podcast are frequently subtle, nuanced and intellectually challenging. They “go deep” and take me with them. In fact, the conceptual density of the podcast sometimes causes me to rewind and replay parts of it in order to fully comprehend the assertions. Advertisers or sponsors of the podcast are neutral. It doesn’t seem likely that they influence the contributors or benefit when commentators assert their points of view. 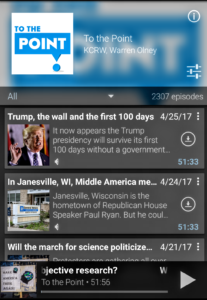 The podcast’s publishers are neutral. They don’t appear to influence the contributors or commentators to present any particular agenda or viewpoint. 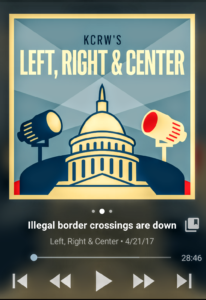 This weekly podcast is totally balanced! And it lives up to it’s tag line as “your civilized, yet provocative antidote to the self-contained opinion bubbles that dominate political debate.” Contributors regularly irritate me by challenging my beliefs. On the Media* [lengths vary: 30 – 60 min.] This weekly podcast digs deep and goes behind the scenes to explore the media spin, distortions and biases that have shaped how the news outlets have reported the week’s most important stories. PBS News Hour* [lengths vary: 5 – 50 min.] 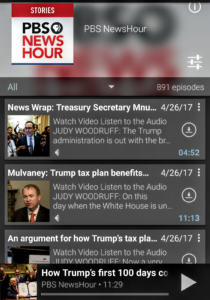 The award-winning PBS News Hour is now available via YouTube and through your favorite podcast app! If you’ve ever watched the show, you know they go to great lengths to make sure topics are explored in depth and in a balanced way. And here’s some good news: You can watch the whole daily show or simply download a single 5 to 15 minute segment and ignore the rest! Make Me Smart* [approx. 45 min.] This weekly podcast is a spin-off of the popular business podcast, Marketplace. It’s about the economy, technology and culture. It can be fun and irreverent, but it’s always insightful. BBC Newshour* [approx. 50 min.] 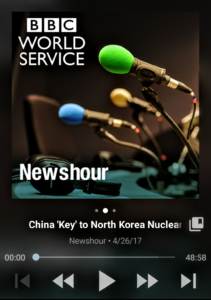 This is BBC’s collection of “interviews, news and analysis of the day’s global events.” I especially like the podcast’s world perspective (as opposed to simply a U.S. point of view). The interviewers clearly do their homework on the issues, gently challenging their international guests with polite yet tough questions that produce revealing responses. I’ve learned much from this podcast! The Economist Radio* [lengths vary: 25 – 50 min.] 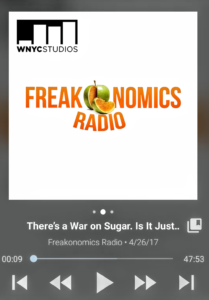 This podcast is NOT just about the economy! It does deep dives into topics as diverse as the French election, flying cars, how to improve our deaths and Donald Trump’s presidency. This is a weekly public radio program that discusses all sorts of socioeconomic issues. The program covers some surprising topics and often views them from wildly differing perspectives. It manages to be irreverent and fun while tackling serious topics and enlightening and (sometimes) irritating its listeners. TED Radio Hour* [lengths vary: 5 – 50 min.] This weekly podcast is “a journey through fascinating ideas, astonishing inventions and new ways to think and create. Based on riveting TED talks from the world’s most remarkable minds.” Each one-hour show tackles a particular theme, interviewing people who have been TED talk presenters, then interweaving these interviews with highlights from their talks. These podcasts are likely to knock you out of your comfort zone! If you really want to know the truth, you have to pursue it actively. You can’t just sit on the shoreline and wave at it like a passing sailboat. No. You have to wade into some deep, sometimes fascinating, sometimes challenging waters. The podcasts above can guide you through these waters and help you find what we’re all looking for: a deeper understanding of what’s really, truly going on around us.